I put these tips in because they will keep you safe and you will still have fun. Don’t post any personal information on-line – like your address, email address or mobile number. Think carefully before posting pictures or videos of yourself. Once you've put a picture of yourself online most people can see it and may be able to download it, it’s not just yours anymore. Don’t meet up with people you’ve met online. Ask your friend if they know someone who is saying they know someone who says they do. change your profile picture to something different so you don't attracted other people look at your Myspace/Facebook. If you are using sites like ‘Bebo’ or ‘MySpace’ you need to ask a grown up who looks after you if it’s okay. They can help you decide if the site you want to join is a good place for you and your friends. 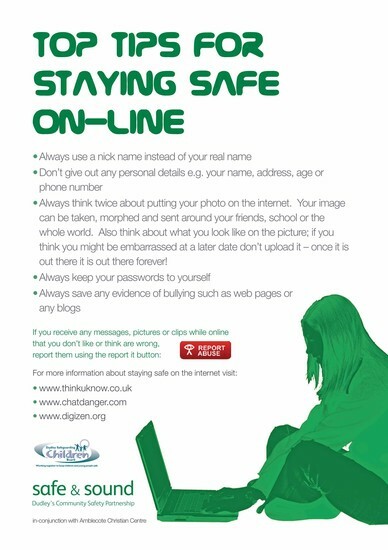 If you already have one of these sites, ask your mum, dad or teacher or whoever looks after you to help you make it safe. They will help you make it a safe place for only you and your friends, and make sure that you don’t tell everyone where you live, what school you go to or share too many pictures. If you are worried or unhappy about anything you see on one of these sites, you can tell a grown up that you like and trust, and they can help you. This information is good because it shows how to stay safe and have fun!